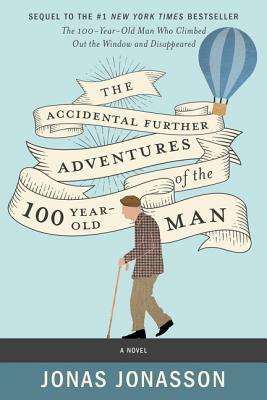 I’m super excited to be part of the TLC Book Tour for Jonas Jonasson’s The Accidental Further Adventures of the 100-Year-Old Man, because the first book, The 100-Year-Old Man Who Climbed Out the Window and Disappeared, was the very first book I reviewed on this blog! Something that makes this sequel different from the first book is it takes place in our present time. It’s so current that President Trump, Vladimir Putin, Kim Jong-un, Angela Merkel, and Margot Wallström are characters in the book. Current events and world conflicts in our reality serve as the backdrop for Allan’s misadventures. So there is a lot of political commentary and satire; Allan and his companions are the conduit. Jonasson doesn’t even try to be subtle, but he uses humor to keep the cynicism to a minimum. I have to be honest, though. There were a handful of times when it got cringy, where it just barely teeters over the edge into “punching down” territory. Overall, though, the humor is used to get a message across. And because of the realistic cast of characters, that message gets uncomfortable. Through Allan’s happy-go-lucky personality, Jonasson takes moments in current events and sums them up tl;dr style. And because Allan has been having these incredible adventures throughout his very long life, the repercussions of a number of historical decisions become a little more clear. Readers are left seeing exactly how simple and complicated international relations are. Which is kind of depressing, but things are moving so fast, you don’t have time to dwell on it. This book won’t be everyone’s cup of tea, but if you enjoy political commentary and satire woven into your books like I do, you’ll enjoy this fun, often silly, fast-paced adventure! Thanks to TLC Book Tours and to HarperCollins for the opportunity to read and review this book! Check out what other readers have to say about The Accidental Further Adventures of the 100-Year-Old Man by visiting other stops on the tour.